They're low in sodium with just 25mg (1% DV) of salt. They contain at least 3 potential allergens: almonds, peanuts, and soy lecithin. PEANUTS, DARK CHOCOLATE FLAVORED COATING (SUGAR, PALM KERNEL OIL, COCOA POWDER, SOY LECITHIN, NATURAL FLAVOR, SALT), ALMONDS, GLUCOSE SYRUP, HONEY, SOY PROTEIN ISOLATE, PEANUT BUTTER (PEANUTS, SALT), UNSWEETENED CHOCOLATE, CHICORY ROOT FIBER, SOY LECITHIN, TAPIOCA STARCH, SEA SALT. Are Peanut Butter Dark Chocolate KIND Bars vegan-friendly? No. Peanut Butter Dark Chocolate KIND Bars are not vegan-friendly because they contain honey. Are Peanut Butter Dark Chocolate KIND Bars gluten-free? Yes. Peanut Butter Dark Chocolate KIND Bars are gluten-free. All 17 ingredients are gluten-free. Are Peanut Butter Dark Chocolate KIND Bars dairy-free? Yes. Peanut Butter Dark Chocolate KIND Bars are dairy-free. All 17 ingredients are dairy-free. Are Peanut Butter Dark Chocolate KIND Bars keto friendly? No. Peanut Butter Dark Chocolate KIND Bars are not keto friendly because they contain sugar, glucose syrup, honey, chicory root fiber, and tapioca starch. Are Peanut Butter Dark Chocolate KIND Bars lactose-free? Yes. Peanut Butter Dark Chocolate KIND Bars are lactose-free. All 17 ingredients are lactose-free. Are Peanut Butter Dark Chocolate KIND Bars paleo? No. Peanut Butter Dark Chocolate KIND Bars are not paleo because they contain peanuts, sugar, palm kernel oil, soy lecithin, glucose syrup, soy protein isolate, peanut butter, unsweetened chocolate, and tapioca starch. 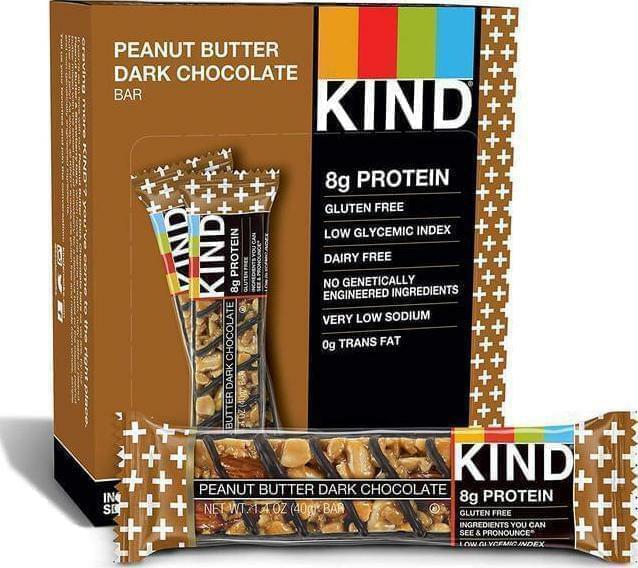 Peanut Butter Dark Chocolate KIND Bars are made by KIND Snacks.